Had the heat really got to me, real madness to start yet another project! Quentin was not keen on the idea as it ‘was his favorite bit of ’lawn’ around here lawn is a loose term describing something green that is mowed. At first I said I’d leave some lawn as a path around the garden but I knew it would not work as I’m the gardener and would be doing all the maintenance. I weeded the adjacent lawn area that I was not removing , and have since reseeded and fertilized it so he still has some lawn(to mow?!!) . The first job was to sure up the bank at the back as there was a big drop to a lower area and most of the timbers which pre date us where all rotted. The next challenge was to find something to replace it . I looked around for suitable materials but when it seemed I had used up just about every possibility I came across some bits of an old rainwater tank, a quick lesson with an angle grinder and some new beds come retaining wall where on their way. 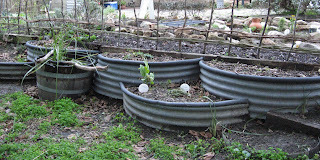 They fitted in nicely, and were then filled with the soil the chooks had piled up along the fence as dust baths in summer , added a spare wine barrel as a pond and hey presto an instant garden! 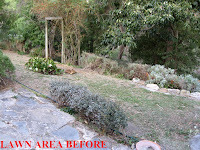 This area would be used for herbs needing shade and extra water. As I started removing the lawn, I was amazed it actually grew, as just under the grass was a mass of big roots all heading towards the house. The roots originated from some large Blackwoods growing right on our boundary, a good example of poor planning by previous neighbours. These trees overhang the lower level and have reduced the growth of a once beautiful persimmon tree as well as nectarine. For the past 20 odd years this has been a problem area, so now I’ve created another challenge and project to make it more productive, beautiful, low maintenance and requiring no additional water (Except for the shade loving herb area)The neighbors where not interested in removing the trees. Being around 500+ meters from their house they had no impact so excuses like ‘their native’ , ‘not in our budget’ etc where predictable .So Quentin borrowed a pole saw and trimmed all he could reach, we have now also organised a tree removalist , who gets his machines serviced here to complete the job as a barter deal. So it’s now in the pipeline so it will be done sooner or latter. 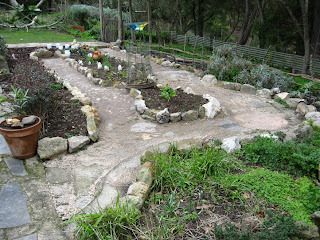 With that organised the development of the culinary herb garden could begin. The basic shape was established to allow easy access for harvesting the herbs. Working on it for about an hour or so in the aftern oons it gradually took shape and selected herbs from other parts of the garden found their new homes there. To blend with the general rustic, country cottage type gardens and paving around the house plus I wanted it to allow some water infiltration and of course it had to cost nothing, so a path from some slate and other found bits of concrete and the like made the main path, the gaps where then planted with wooly yarrow (Achillea tomentosa). 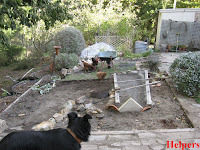 Another path between the lawn and herbs that leads to the lower level was constructed and the gaps planted with various thymes. By this time I had exhausted the supply of suitable paving materials so the final path was made from small rocks I pick up around the place as they usually have one flattish face. To finish the garden off I’m weaving a fence along the back of the high level. 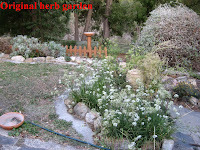 The fence gives the garden form especially until the herbs develop. I’ll wait till the Blackwoods are trimmed before finishing the fence off incase it gets smashed by falling branches. With all this done it’s just a matter of waiting for the herbs to grow, choosing some more, mainly annuals at the Herb Society’s herb day in November. The Top garden has developed into a great space. Here's what's planted there so far. Next challenge what to do with the lower level! I have a new idea and project in the planning so stay tuned.